The weather's getting colder, which means it's crochet season for me! Nothing more relaxing than crocheting while getting cozy on the couch with a hot cup of tea! I've been making a few small things here and there for Christmas. 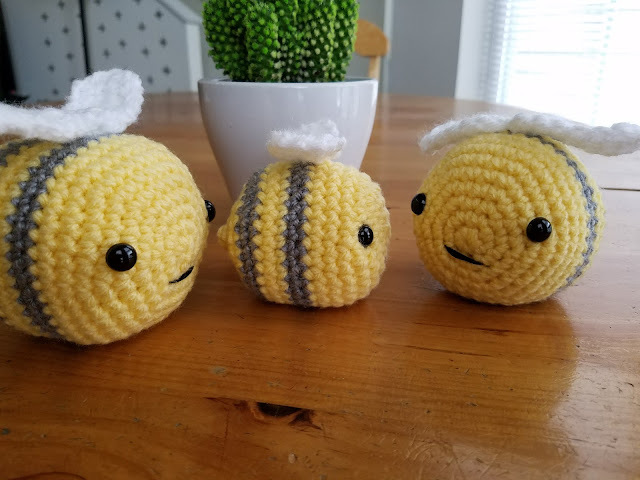 I love making smaller projects as it doesn't take long to make them in bulk! 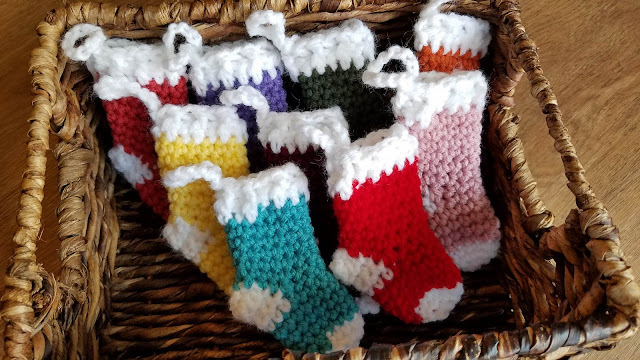 I will put up another post soon with some of the other Christmas projects I've been working on from other patterns. These adorable mini stockings would be perfect as ornaments, gift toppers, or even key chains! You can make them a little bigger too and put gift cards in them. I'll be giving these out to co-workers in the office. 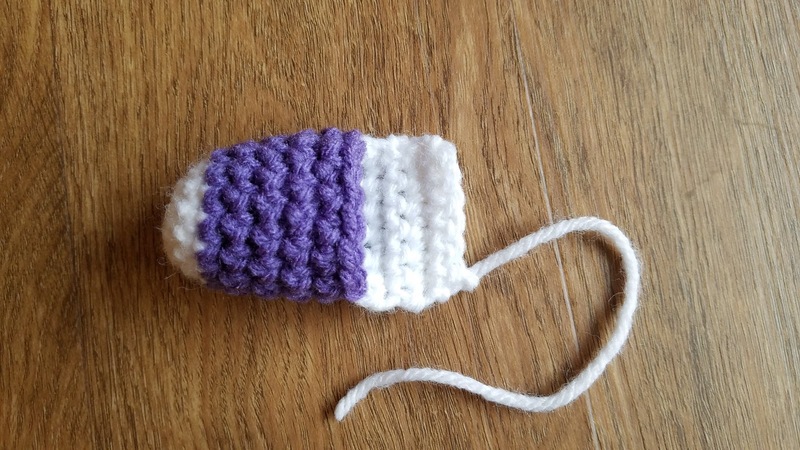 Each one takes about 15-20 minutes to make, and measures 4.5 inches long. 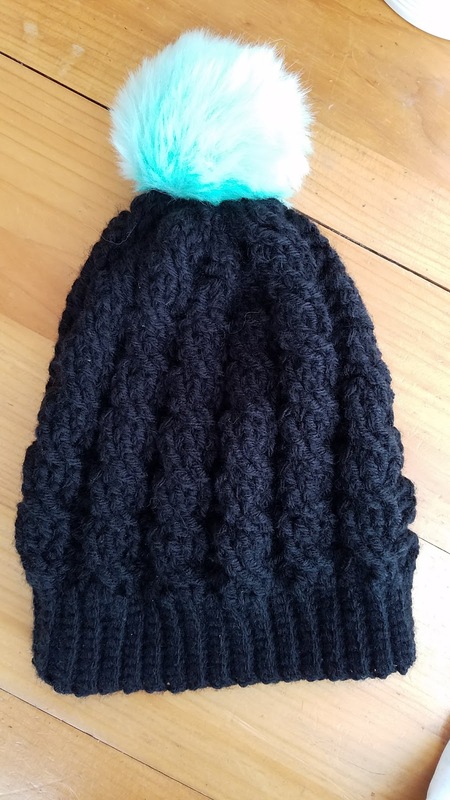 What's great is you can make them in any color combination based on the yarn you currently have. 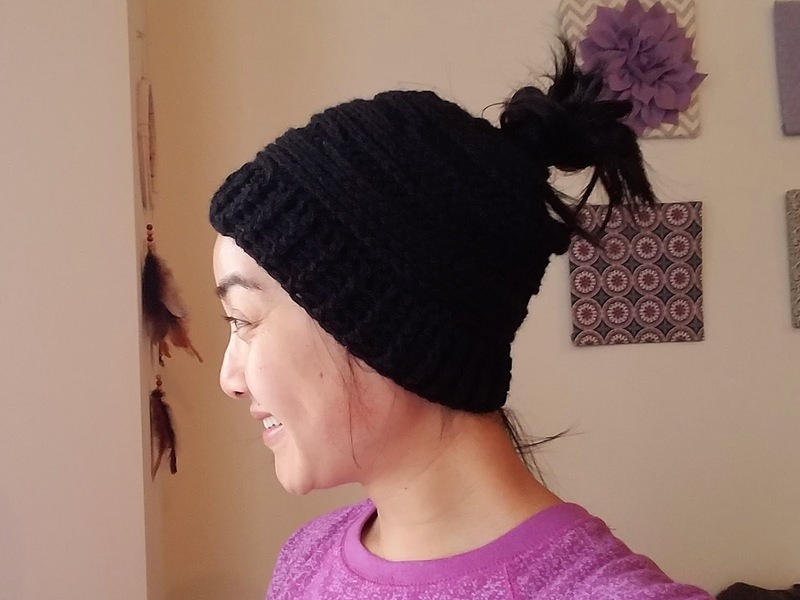 They're a fantastic way to use up all that extra scrap yarn! I think they'd look great as one solid color or stripes too. The pattern is worked in a continuous round when the step calls for rounds. 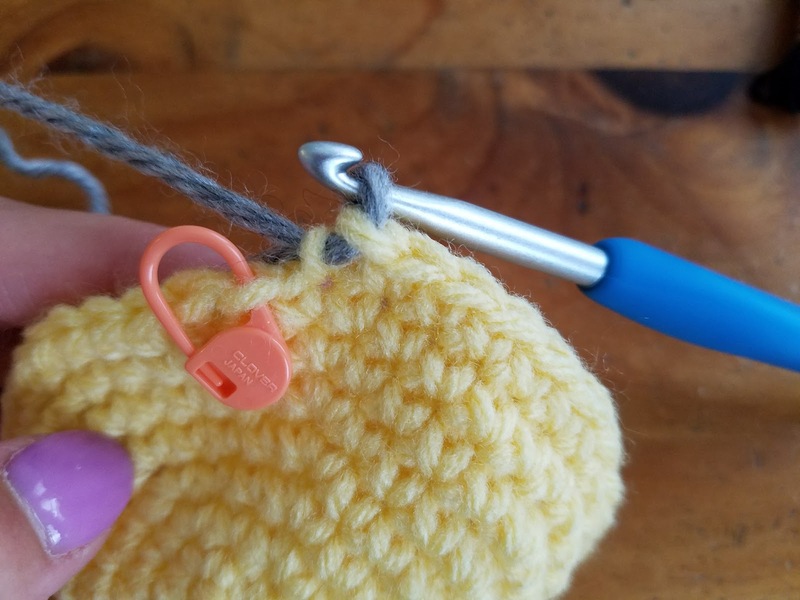 Use a stitch marker to keep your place. Change colors as indicated in pattern. When I change colors, I fastened off. 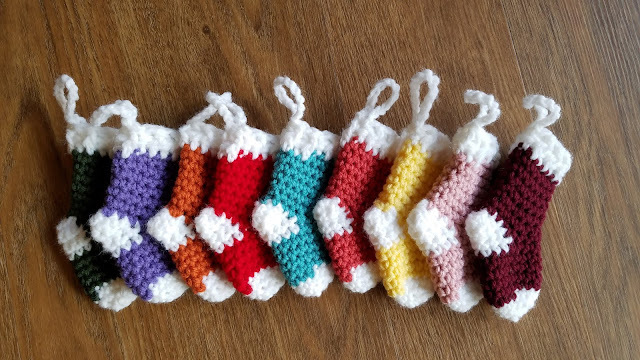 You can hide your tails inside the stocking to avoid sewing them all in at the end! With [A], make mc and 7 sc in mc. Fasten off leaving ~5 inch tail. Fold the heel and use a tapestry needle to sew the end of it together. This is what it looks like after Row 12. Use tail to sew end where arrow is pointing. Should only be ~3 stitches to sew it. We will now be working in rounds. With [B], attach in the middle of the heel with a sc and make 14 sc evenly around. Where [A] meets [B] on both sides, make 2sctog to join the two colors (14 sc). Where the arrow is pointing, make 2sctog. On the other side - where the arrow is pointing, make 2sctog. 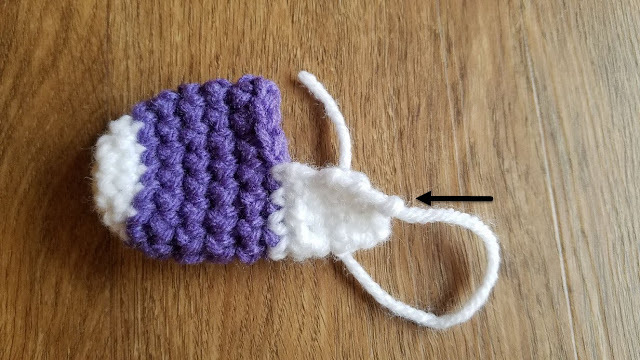 If you complete the stocking and you are not at the top of the heel, slip stitch around the cuff until you are at the top of the heel. Ch 15 and then slip stitch in the same stitch as the start of the chain. My co-worker is going to have her first grandson! 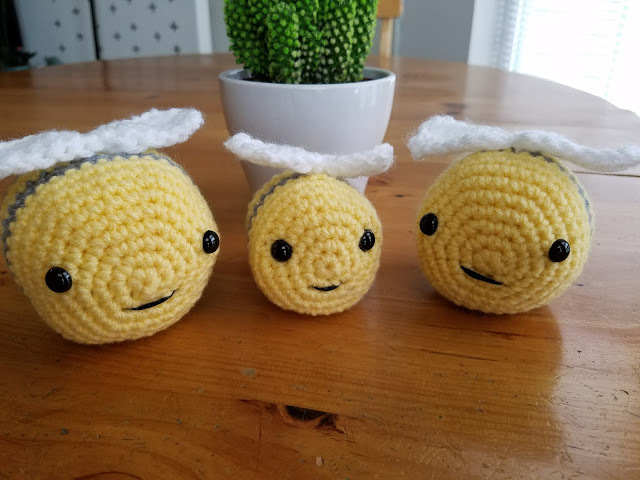 Her daughter-in-law is having a bee themed baby shower, and she wanted to have a little bee family to really tie the mom to "bee" theme together. 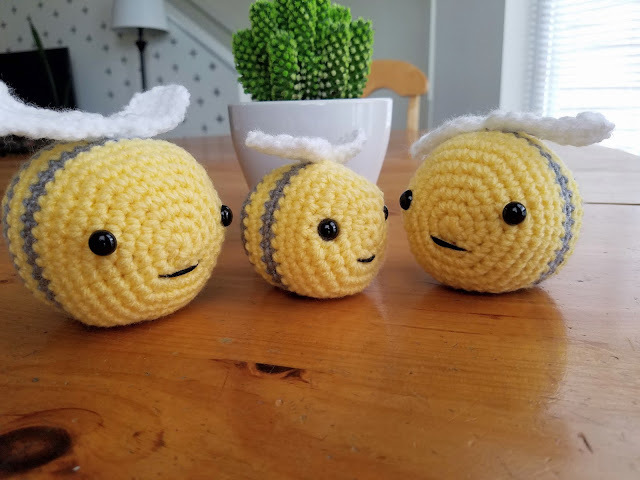 I think the theme is so adorable and these amigurumi bees will add such a nice touch to the baby shower. I'm so glad my co-worker asked me to make these. 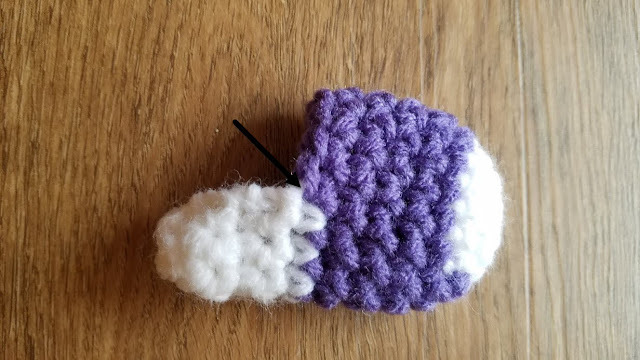 I was in a crochet lull for what seemed like forever, and this was the perfect thing to reignite the creative spark in me. I hope you all enjoy this pattern! 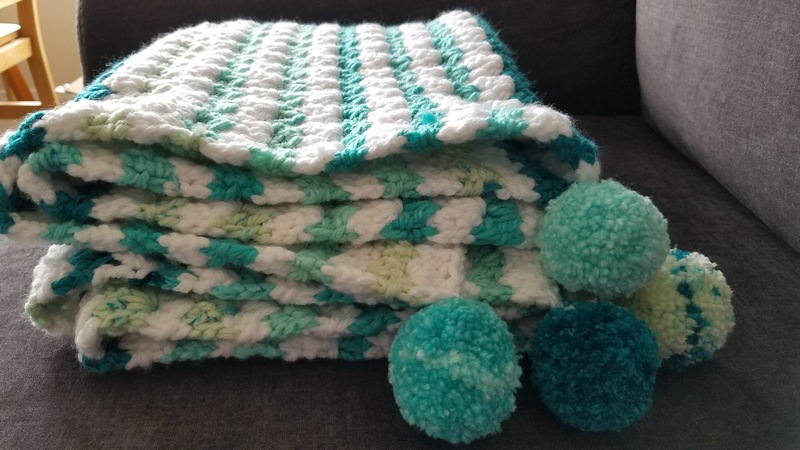 It works up so quickly and it'd be perfect for, not only baby showers, but for nurseries or for toddler/baby birthdays! 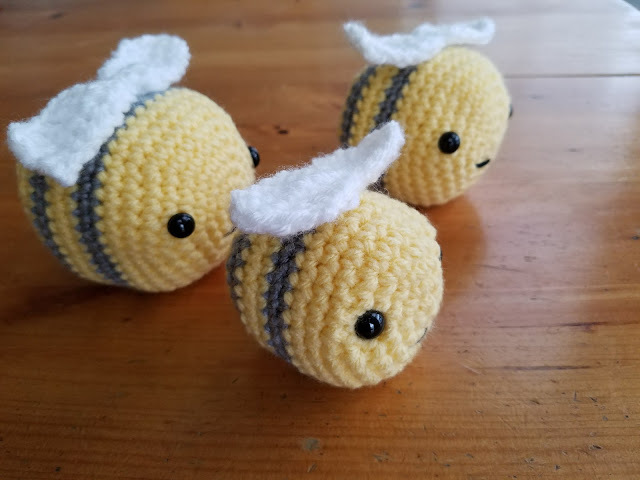 The baby bee measures about 3.5" long and 3" tall. The mom bee measures 4" long and about 3.5" tall. The dad bee measures 4" long and 4" tall. 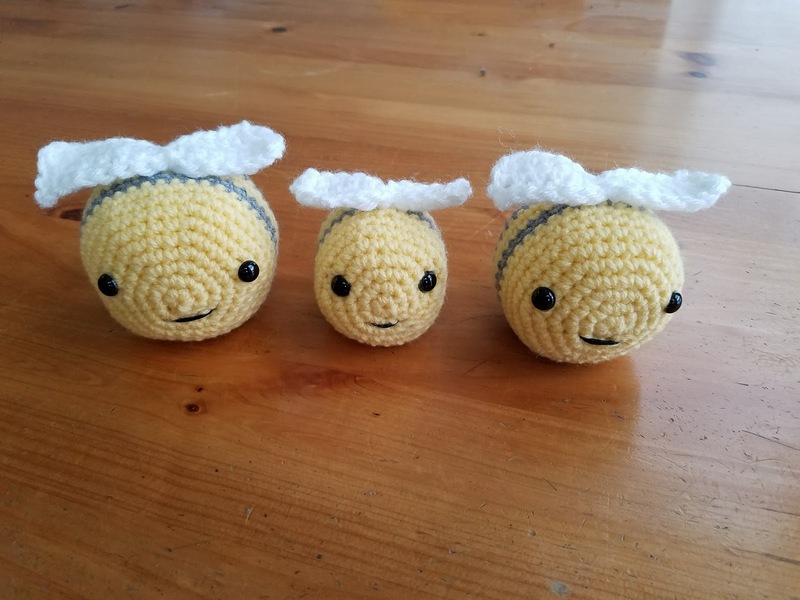 Once you get the baby bee down, the mom and dad will be simple to make as the patterns are very similar with just an addition of a round/row for the body and wings. 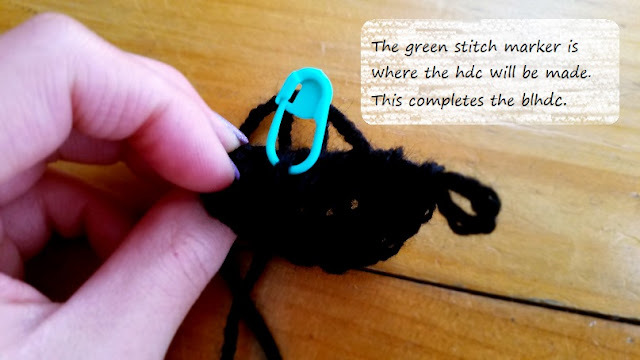 Insert hook in front loop of the next stitch, and then immediately in the front loop of the next stitch. Yo, pull through two loops. Yo, pull through two loops. *Tip: It helps to turn the hook up when inserting in the front loops and go from underneath the loop. 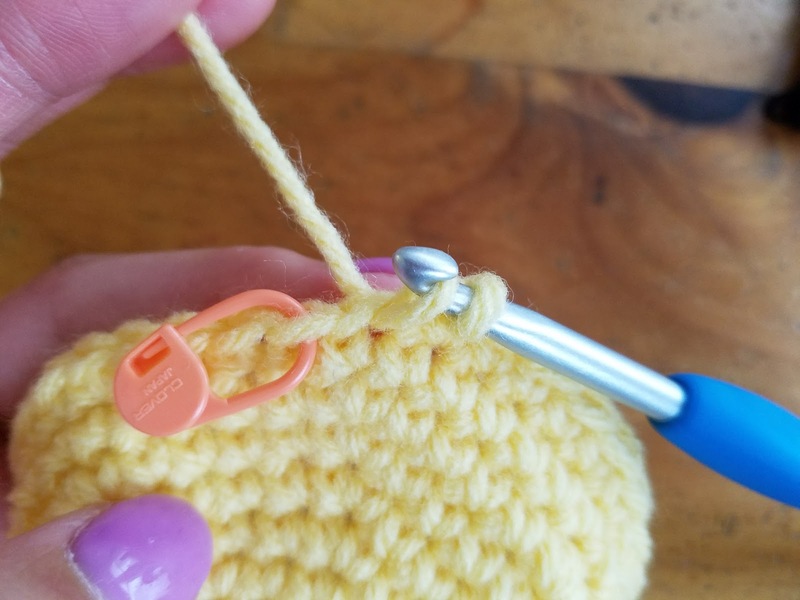 The body of the bee is worked in rounds, so use a stitch marker to keep track of each round. Change yarn colors as indicated in each step. I changed colors by pulling through with the new color in the last st of the round. I kept the colors attached and picked up the color I needed when I got to that round. This makes it very easy since you don't have to cut and attach a new color, and the stripe jogs will be hidden inside the body. It's a win-win! At the last st of the round, pull through when making the sc, but do not complete it. With the new color, yo and pull through both loops to complete the sc. Now you can drop the old color and start working the next round with the new color. 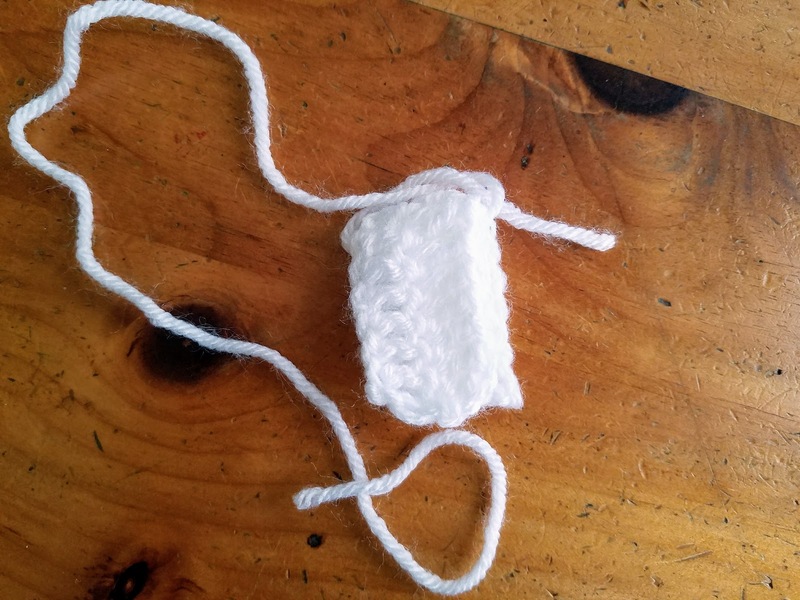 In mc, make 6 sc with yellow yarn. Insert safety eyes between rounds 4 and 5. I counted out from the center so that I knew the eyes would be evenly spaced. 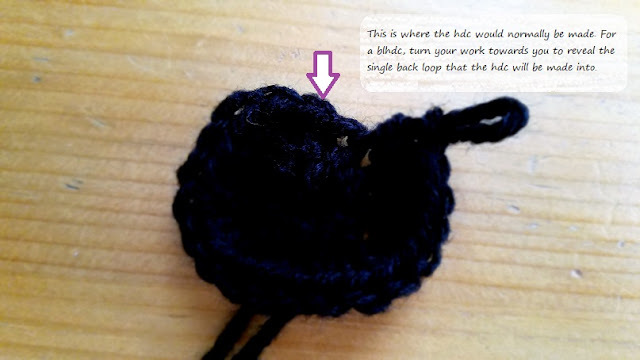 *Tip: Insert the eyes so that the top of the head is opposite of the beginning of each round. That way slight unevenness of the stripes will be at the bottom of the bee. Stuff body with poly fill now. Be careful not to over stuff the body. 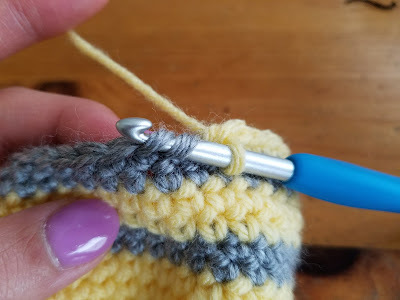 Use the tapestry needle to close up the hole. This completes the body and also leaves a little stinger at the end! Fasten off and weave in ends with tapestry needle. Cut a long piece of white yarn (~12 inches ). 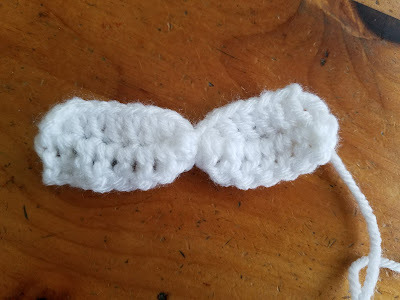 Fold the wings in half over the piece of yarn and tie a knot to cinch the middle. Tie the knot so that one end of the string is longer than the other. The longer end will be used to sew the wings to the body. Sew the wings to the top of the body with the tapestry needle. 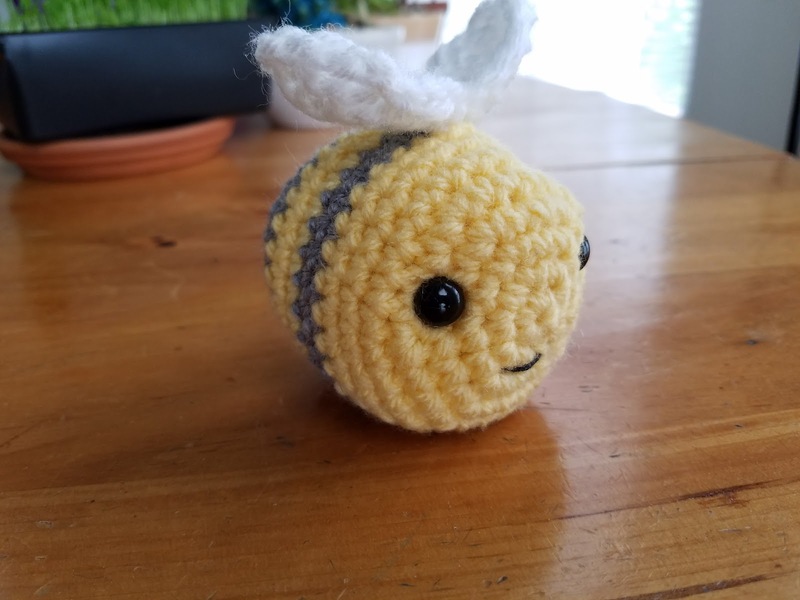 Use the black embroidery floss to create the mouth on the bee. 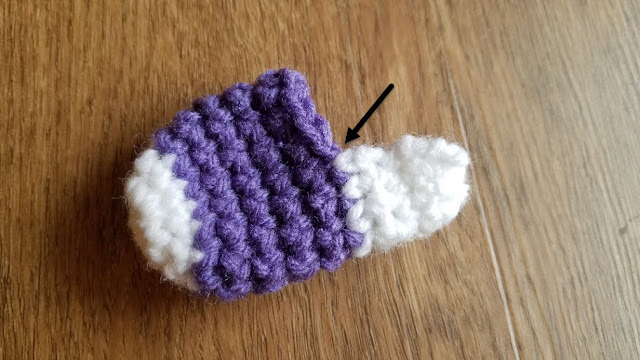 Here is a great video tutorial on how to embroider on amigurumi. Insert safety eyes between rounds 5 and 6. 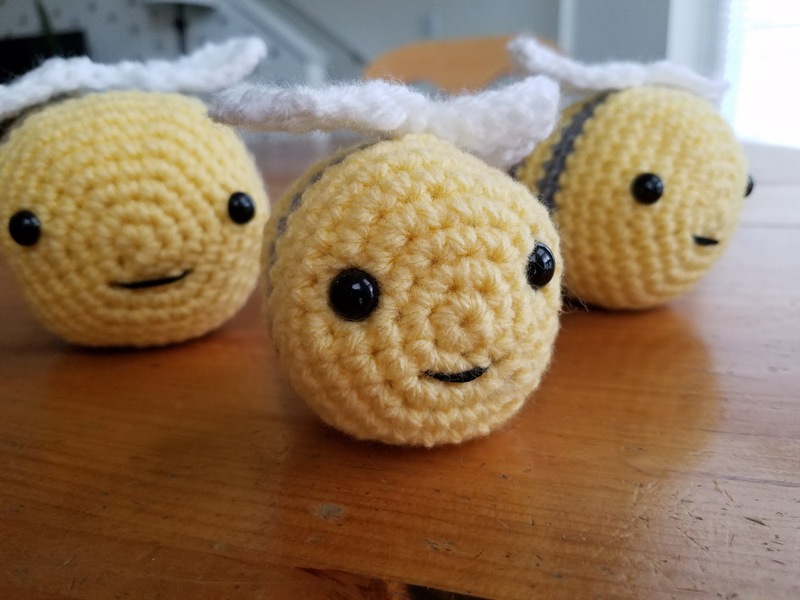 I counted out from the center so that I knew the eyes would be evenly spaced. Sew the wings to the top of the body with the tapestry needle. Use the black embroidery floss to create the mouth on the bee. My co-worker, who is a huge basketball fan, just had a baby boy and I thought this basketball cocoon would be the perfect gift for him and his wife. Their son, who is pictured above, looks adorable in it! The pattern is from Crowned Crochet, priced at $2.50, and was very easy to follow. The net can be adjusted so that it's longer or shorter. The beanie is actually from Repeat Crafter Me and is free! The hardest part was getting the black lines straight on the beanie. Nothing a little tape can't fix though! Overall, I think the set turned out great and is such an easy project for all sports fan parents! 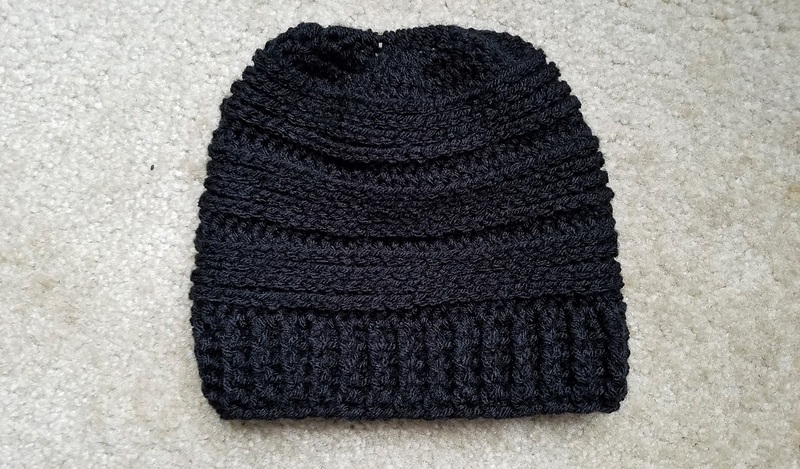 I've been falling behind severely in my crocheting and blogging. It's been a busy, fun, and interesting year since my move to New York. What a difference in the weather I've experienced! I was so excited for my first Fall on the East Coast. The trees and scenery in general was absolutely gorgeous with all of the different colors! 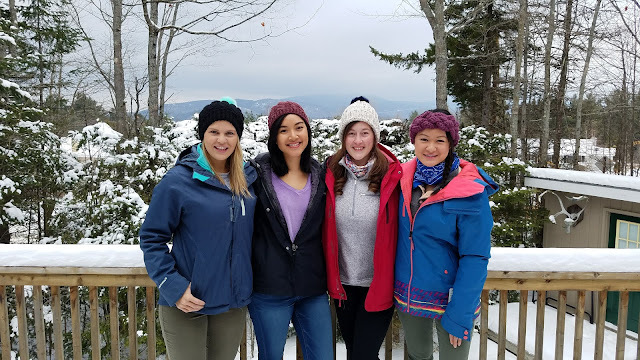 Winter was a bit of a shock with the snow, but from what I've been told, it was a pretty mild winter this year. It was a nice transition for me though, so that worked out! In the Fall, I worked on two projects, the first one being amigurumi beavers. I volunteer weekly at a beaver animal sanctuary that also houses and cares for other animals as well. 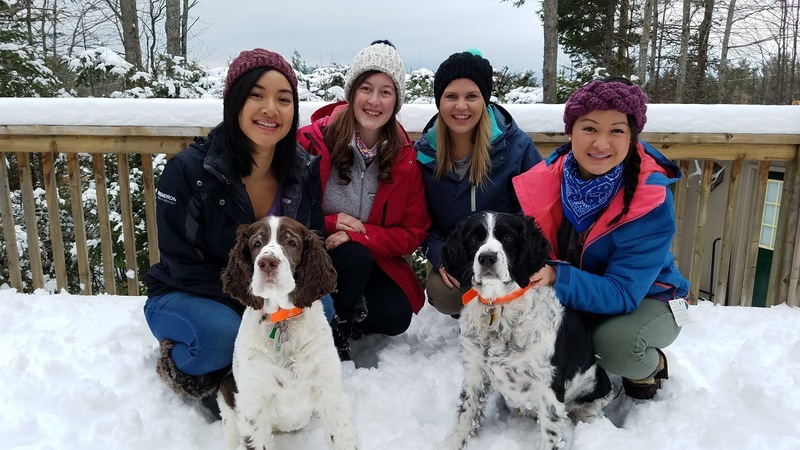 Not only does the lovely couple run an animal sanctuary, but they also run a bed and breakfast right there on the property. All of the proceeds go directly to the care of the animals. I thought it would be a great opportunity for them to raise some money by selling crochet beavers to their guests in their small gift shop. 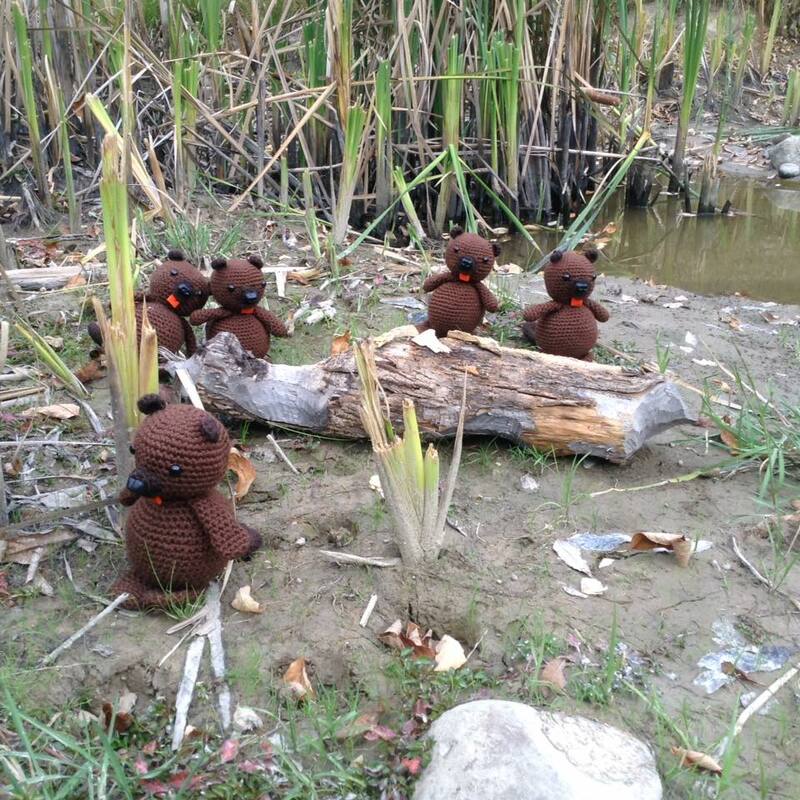 I donated a bunch of these adorable beavers to them, and am thinking about making other animals that they have on the sanctuary as well (dogs, cats, a mini horse and donkey, goats, and chickens). 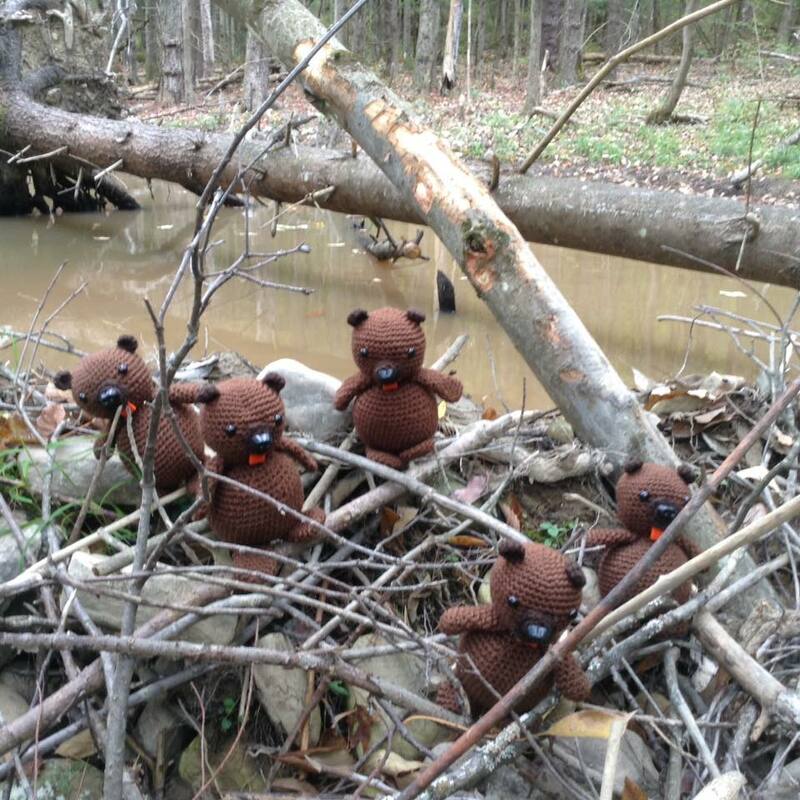 These kits were adapted from Sharon Ojala's beaver pattern. Fun fact: beavers have orange teeth because of a hard iron enamel coating that gives their teeth the strength to cut through trees! They are often illustrated with white teeth. 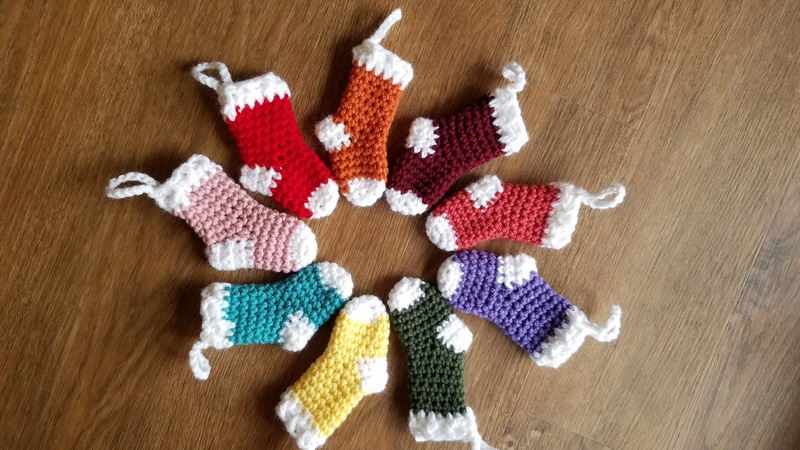 I love making quick seasonal gifts for people. I made a few of these pumpkin pouches from Repeat Crafter Me for friends and co-workers. They were perfect for holding candy or other Halloween treats! They worked up so quickly and the pattern was easy to follow. My favorite thing about the pouch is the curly vine and leaf. It adds such a cute touch to it! These boot cuffs are back up on the Etsy Shop! Place your order in before fall/winter approach, and get your holiday shopping done early! 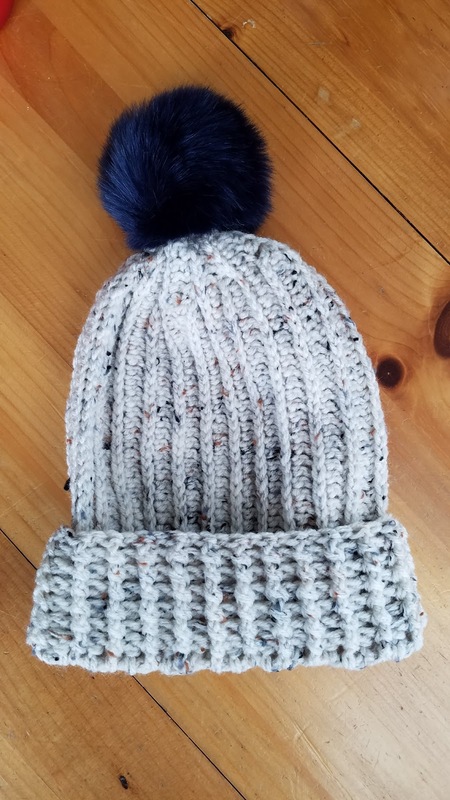 I'm also taking custom orders, so if you'd like something in particular for yourself or a friend/family member, you can leave a comment below, or reach me on Facebook. I will hopefully have some new patterns coming along before the end of the year, so stay tuned! My last few projects have been scarves with pockets, and I'm really liking the practicality of these things! 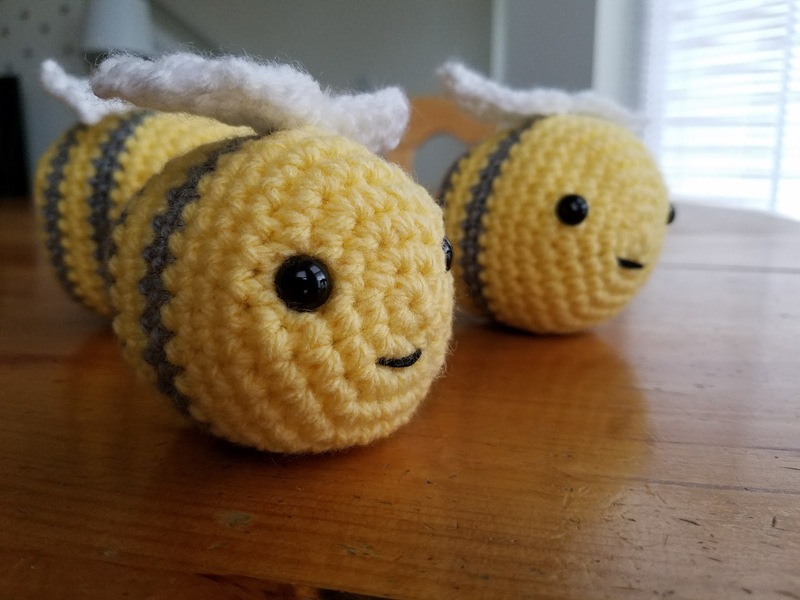 I'm going to have to make some for myself once I finish all the projects in my queue. 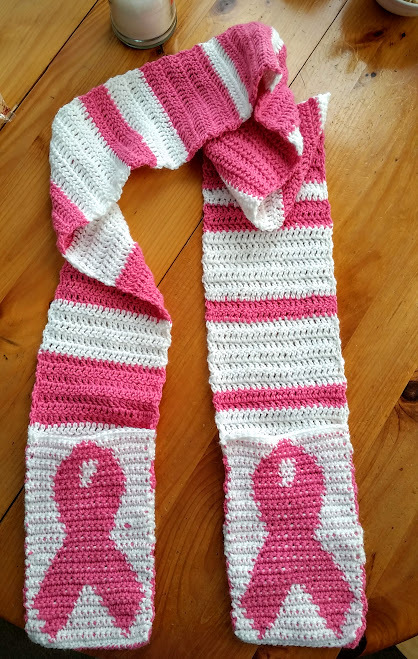 This Breast Cancer Awareness scarf uses tapestry crochet to create the design on the pockets. 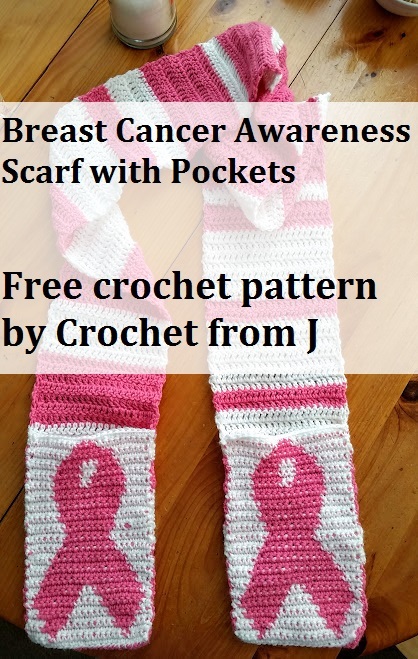 Perfect for any survivor or supporter in your life to keep warm this winter. 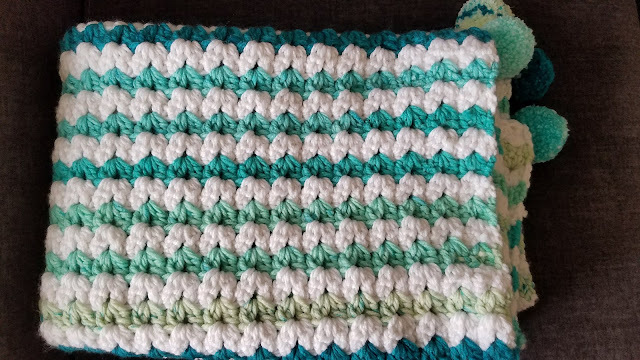 With only two colors, it's a great project for beginners looking to work on their color changing techniques. 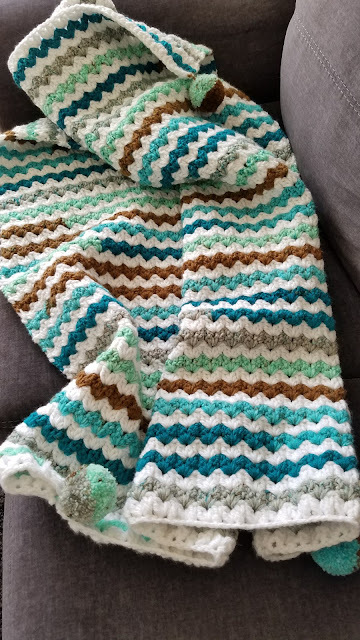 For the main scarf part, I used a random stripe generator for the pattern. 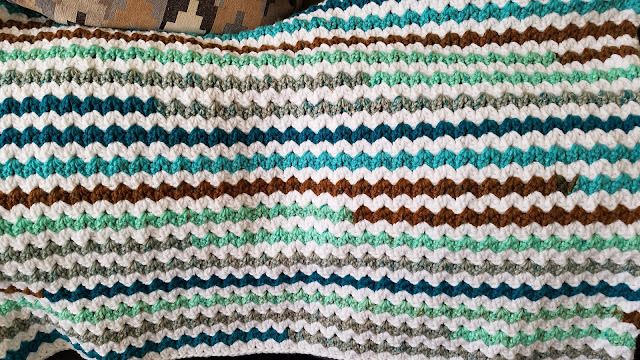 I love this app because you can enter in which colors you're using and how wide/narrow you want the stripes to be. It will then spit out a random pattern and you can go from there. It's a great variation to typical stripes and it looks really cool. I've used it on scarves and blankets, and have always loved the results. I wrote what the app generated for me in the pattern below, but feel free to use it for your own scarf and see what it comes up with. 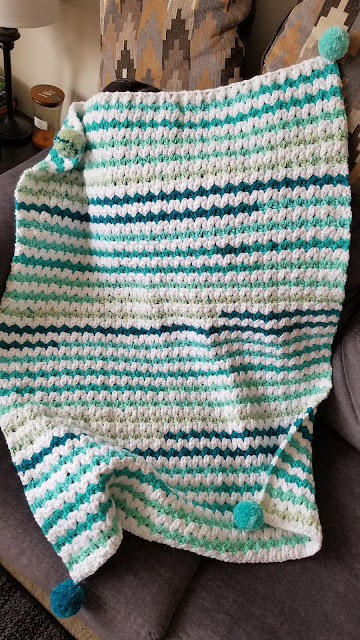 My completed scarf ended up being 89 inches long. 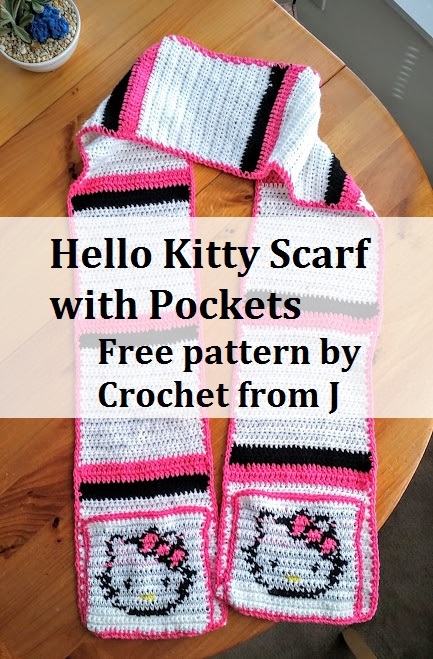 The pockets are made separately and then sewn onto the completed scarf. For the color change, I carried both colors and worked over the color that wasn't being used. 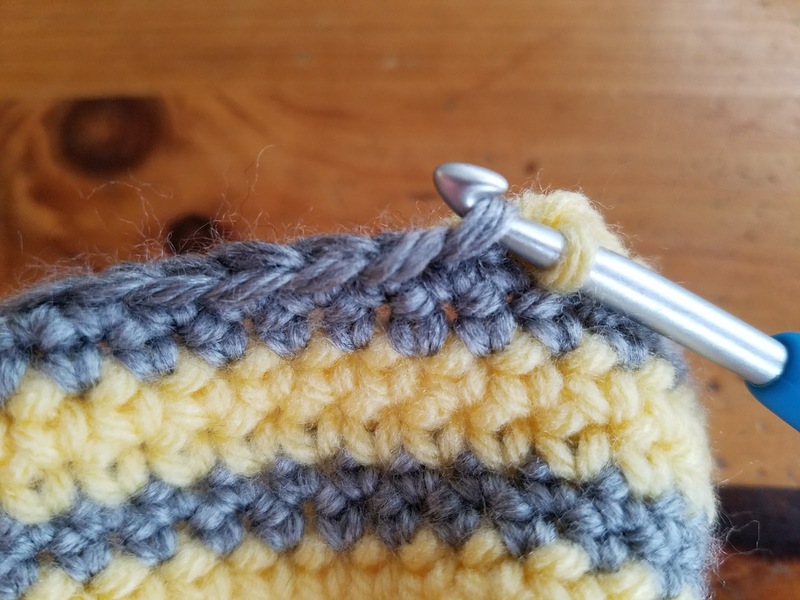 Tip: Work over ends at the color changes to avoid weaving in so many ends when complete. Leave a ~50 tail for sewing and fasten off. Dc in next 23 st. (23 dc). In white, dc in next 23 st. (23 dc). In pink, dc in next 23 st. (23 dc). Fasten off and weave in/cut all loose tails. 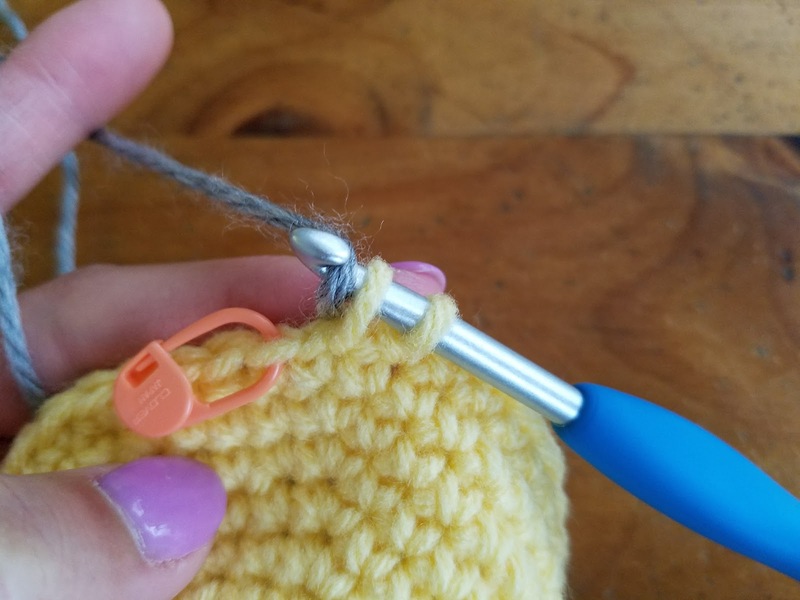 Use a tapestry needle to whip stitch the sides and bottom of the pockets to each end of the scarf. Weave in all ends. 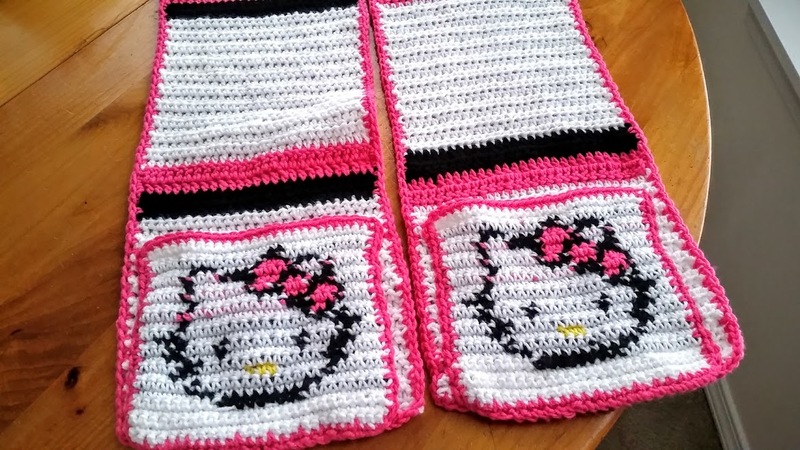 The same person who requested the scarf with pockets loved them and has requested more scarves with pockets! They're really easy to make and are practical too. I've got a lot of projects lined up, including a pink ribbon scarf with pockets for breast cancer awareness, a Hello Kitty afghan, and a queen sized comforter, which will be my biggest project yet. 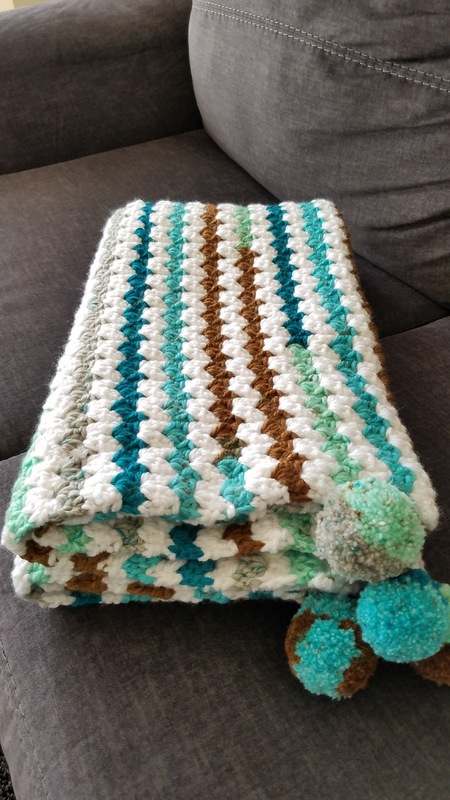 This scarf uses the same tapestry crochet technique as the SF Giants Scarf, Batman, and Superman Scarf. 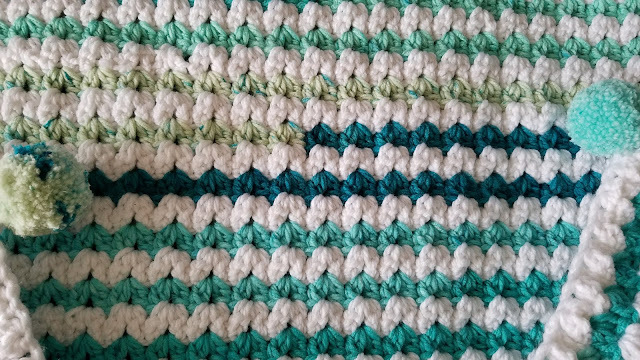 If you're unfamiliar with tapestry crochet, I would highly recommend looking up how to carry more than two colors for the color changes. It becomes much easier once you get the hang of it, so keep practicing! Sc in next 6 sc. In black, sc in 1 sc. In white, sc in next 13 sc. In black, sc in 1 sc. In white, sc in next 6 sc (27 sc). Sc in next 4 sc. In black, sc in next 2 sc. In white, sc in next 6 sc. In yellow, sc in 3 sc. In white, sc in next 6 sc. In black, sc in next 2 sc. In white, sc in next 4 sc. (27 sc). Sc in next 5 sc. In black, sc in next 2 sc. In white, sc in next 13 sc. In black, sc in next 2 sc. In white, sc in next 5 sc. (27 sc). Sc in next 3 sc. In black, sc in next 3 sc. In white, sc in next 3 sc. In black, sc in 1 sc. In white, sc in next 7 sc. In black, sc in 1 sc. In white, sc in next 3 sc. In black, sc in next 3 sc. In white, sc in next 3 sc. (27 sc). Sc in next 4 sc. In black, sc in 1 sc. In white, sc in next 4 sc. In black, sc in 1 sc. In white, sc in next 7 sc. In black, sc in 1 sc. In white, sc in next 4 sc. In black, sc in 1 sc. In white, sc in next 4 sc. (27 sc). Sc in next 4 sc. In black, sc in 1 sc. In white, sc in next 14 sc. In black, sc in next 2 sc. In white, sc in 1 sc. In black, sc in 1 sc. In white, sc in next 4 sc. (27 sc). Sc in next 5 sc. In black, sc in 1 sc. In pink, sc in next 2 sc. In black, sc in 1 sc. In white, sc in 12 sc. In black, sc in 1 sc. In white, sc in next 5 sc. (27 sc). Sc in next 5 sc. In black, sc in 1 sc. In white, sc in next 10 sc. In black, sc in next 3 sc. In pink, sc in 3 sc. In black, sc in 1 sc. In white, sc in next 4 sc. (27 sc). Sc in next 4 sc. In black, sc in 1 sc. In pink, sc in next 2 sc. In black, sc in 1 sc. In pink, sc in 3 sc. In black, sc in next 3 sc. In white, sc in next 6 sc. In black, sc in 1 sc. In white, sc in next 6 sc. (27 sc). Sc in next 5 sc. In black, sc in 1 sc. In white, sc in next 6 sc. In black, sc in 1 sc. In pink, sc in 2 sc. In black, sc in 1 sc. In pink, sc in next 3 sc. In black, sc in next 3 sc. In white, sc in next 5 sc. (27 sc). Sc in next 5 sc. In black, sc in 1 sc. In white, sc in next 2 sc. In black, sc in next 3 sc. In pink, sc in 3 sc. In black, sc in 1 sc. In white, sc in next 6 sc. In black, sc in 1 sc. In white, sc in next 5 sc. (27 sc). Sc in next 5 sc. In black, sc in 1 sc. In white, sc in next 3 sc. In black, sc in next 4 sc. In pink, sc in 4 sc. In black, sc in 1 sc. In white, sc in next 3 sc. In black, sc in 1 sc. In white, sc in next 5 sc. (27 sc). Sc in next 6 sc. In black, sc in next 3 sc. In white, sc in 1 sc. In black, sc in 1 sc. In pink, sc in 2 sc. In black, sc in 1 sc. In white, sc in next 4 sc. In black, sc in next 3 sc. In white, sc in next 6 sc. (27 sc). Sc in next 14 sc. In black, sc in next 2 sc. In white, sc in next 11 sc. (27 sc). Sc in next 27 sc. (27 sc). In pink, sc evenly around entire piece to make a pink border. Join to the beginning with a sl st.
Fasten off and leave a ~56 inch tail for sewing. Hdc in next 27 sc. (27 hdc). In black, dc in next 27 hdc. (27 dc). In pink, dc in next 27 hdc. (27 dc). In white, hdc in next 27 hdc. (27 dc). Repeat rows 22-28 until scarf is the desired length, ending on a white block. Mine measures 88 inches. Do not fasten off. 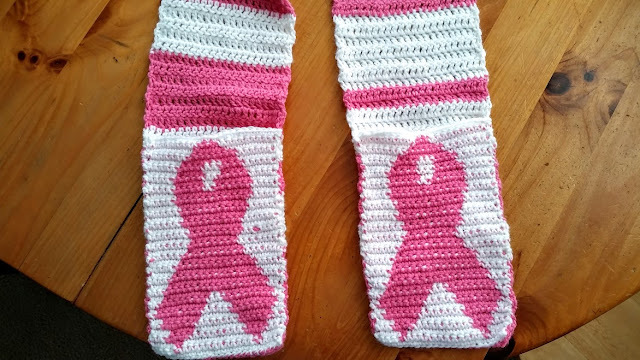 Attach pink yarn. In pink, attach to corner of scarf with sl st. Ch 1 and sc evenly around entire scarf. Use tapestry needle to whip stitch the sides and bottom of the pockets to each end of the scarf. Weave in all ends.